A lot can happen in a few weeks. Within a couple of weeks of this interview happening Editors went in to the studio with mournful Mancs Elbow to record "Let Your Good Heart Lead You Home", the B-side to new single "Blood". Designer Magazine however did catch up with Tom (Vocals) and Russell (bass) to discuss the bands appearance on the surreal MTV Spanking New Series of gigs, the bands formation in Brum and the forthcoming album "The Back Room"
Q: New band, well Spanking New band according to MTV. The obvious question first - is this your first band and how did you get together? Russell: Yeah. We formed at University, we've been going for a couple of years although we lived together for about 4 years. After we finished Uni we decided to give it a go and that's what we've been doing ever since. Q: It was Birmingham wasn't it? Russell: Well Staffordshire University and then we moved to Birmingham. It's a good place to be because it's out of the way of London. Tom: Obviously when you finish University the thing to do is to move to London to try and get a deal, but for us because our management were based in Birmingham it made sense to move there. Russell: It's actually done us a favour because there are so many bands in London trying to get a deal that if you're good enough the industry will come and travel to check you out. Tom: So in a round away band even though we're not a Birmingham band, the fact we're from Birmingham has done us a favour. Q: So which unsigned bands should we look out for at the moment in Birmingham? Russell: There are a lot of good unsigned bands knocking around at the moment. A band called The Big Bang, The Priory, Neon Twang. It's so culturally diverse at the moment it's hard to pinpoint a scene because there's not just one thing going on like it is for the Futureheads. Tom: People always mention Ocean Colour Scene and UB40 when they think of Birmingham, but there's Black Sabbath, King Adora, Led Zeppelin, Judas Priest. It's not like Manchester where there's the Madchester sound. Q: Even though you're not from Manchester, Editors do have that Manchester sound don't they? Tom: People are mentioning New Order and newer stuff like Doves, that's fine cos they're bands we really respect. We're a bit young to be influenced by Joy Division and New Order, but we're discovering those bands now that people have started mentioned them. We take influences from Manchester bands such as Doves and Elbow and then bands like the Walkmen, it's more the darker side of Manchester than the pub-rock side of Manchester. Having said that the reason I started playing guitar was because of "Definitely Maybe"
Q: You had the first single "Bullets" out at the end of January right? Q: The bands that played this "MTV2 Spanking New" event last year were Kasabian and Bloc Party. You guys are headlining. How does it feel to be following in their shoes? Tom: It's a great stamp of approval. I mean I'm sure there were some bands that played last year that we haven't heard of since. We're gonna try out best to not be one of those. Russell: We've actually been doing a few of the Club NME dates as part of the tour leading up to this and they've been telling us that our dates have been the biggest dates since they started the nights. And even better people are coming to the shows cos they like what they hear - we haven't been one of the hyped bands at all. Tom: We're lucky because we haven't been hyped by someone like the NME. If that starts happening there isn't much you can do to stop it. Signing to an independent label helps because if you sign to a major label you're going to be everywhere straight away, with less money you can build slower and it's more of a natural process. Q: Have Editors always sounded the way you do sound now or has it changed over the years? 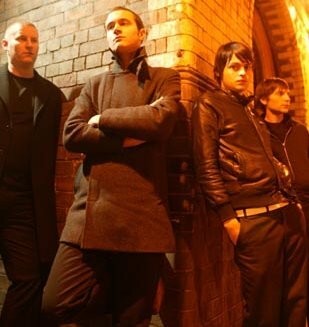 Tom: We've always been dark and moody musically. When we first moved to Birmingham to look for a deal we probably put a lot more energy in there, but it's still about the songs really. I write the words and the melody, send them out to everyone else and they come back with their individual ideas and we try to slot them all together. It's a real merger of ideas. Normally the idea of the song I have in my head is nothing like it turns out to be, and that's good because it means it's coming from all four of us. Russell: I just listen to his idea in a mini-disc and it's usually completely different from Tom's idea is....but then it's totally different from Chris' (guitarist) part. Tom: It's like a factory floor. Everyone's got their little station. Everyone goes along add their little bit and by the end of it you've got a hit or something (laughs)...or a miss. Q: The recent single "Munich" shows the 2 different sides to Editors. The single which is more uptempo and immediate and then the B-side "Release" which is dark and melancholic. Are those the 2 sides to the band? Tom: I haven't really thought about that. For the past year we've just been writing songs and you have a league table of songs. You've got the ones that are gonna be on the album, the ones that don't quite fit in the sound of how the albums going to be - they're not worse, they just don't fit in so they go as B-Sides and stuff. I don't know about 2 different sides, I hope we've got more than 2 different sides. I still like to think "Munich" is miserable music, even if you can dance to it, it's still got that dark edge. Q: What are the stand-out tracks of the forthcoming debut album? Tom: A song called "Camera" which is a bit of a departure from our live sound at the moment. We'll hopefully be doing it on the next tour. We had a track that as well that we were never happy with when we played or recorded it live, so we slowed it down and it's the centre piece of the album. The album's title "The Back Room" comes from that. What we were trying to do with the live sounding songs is take that vibe on tape, but then give it a little bit more depth and add an undercurrent of electronica stuff.